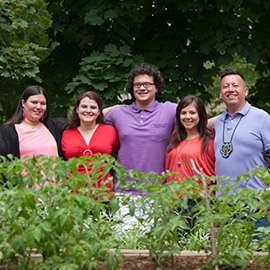 Laurier’s Aboriginal Student Centre, located on the university’s Waterloo campus, recently won the Community Engagement Award from REEP Green Solutions for its Mino-Kummik: Aboriginal Community Garden. The award was presented to Melissa Ireland, Aboriginal student support coordinator (Waterloo Campus), who worked closely with Claire Bennett, manager, Sustainability Office on the project. In 2012, the Aboriginal Student Centre and the Laurier Sustainability Office needed to correct a stormwater challenge. Stormwater was making its way into the basement of the student house centre on Albert Street and was also eroding a steep slope on the property. At the same time, the centre needed water to irrigate a garden that they were planning to build as part of a teaching and ceremonial space in their back yard. They approached the RAIN program, a stormwater education and action program created by Green Communities Canada, which is delivered locally by REEP Green Solutions. RAIN encourages property owners to soak up rain on their properties in order to reduce flood risk, protect local waterways and qualify for stormwater credits in Kitchener and Waterloo. The stormwater solution they developed was a rain garden on their slope and a cistern with an electric pump. Today, the Mino-Kummik garden, the Anishnabe word for good, bountiful earth — has flourished from an idea to a reality for the Aboriginal Initiatives office. Mino-Kummik features a vegetable and fruit garden, ceremony space and a seating area. The garden is also open for class instruction, campus group meetings or student study space. For Aboriginal students, it can become a place where they reconnect with their heritage. The REEP Green Solutions awards event, Celebrating Community Action: REEP’s 15 Years, included local dignitaries, such as Regional Chair Ken Seiling and Waterloo Mayor, Brenda Halloran. The goal of the event was to celebrate some of the people who have made exemplary energy efficiency and stormwater improvements. “This is our way of saying thank you to the ordinary homeowners, teachers, and organizations who are making our community more sustainable,” said Mary Jane Patterson, executive director of REEP Green Solutions.